LDesigns: Get Your Bling On! This will be your favorite shirt this holiday season! Get your bling on is available in a red burnout crew - perfect for layering with a light weight long sleeve tee or long sleeve lace tee. LDesigns has them all and can hook you up! 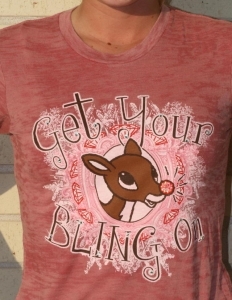 Tee runs S-XL $55 with bling!